Described as the “common cold” of mental illness, depression affects millions of Americans each year. For instance, in 2005 – 2006, according to the Centers for Disease Control and Prevention (CDC), “More than 1 out of 20 Americans 12 years of age or older reported current depression.” What’s more, as widely reported, once an individual suffers from a depressive episode, he or she has a 50 percent risk of suffering from another. Contrary to popular notion, suffering a depressive episode means more than just having a bad day or feeling sad. Depression remains a serious mental health threat, and arming yourself with evidence-based information is the first step to warding off this serious problem. In this sense—and as noted above—a depressive episode extends beyond normal feelings of sadness. It has psychological and physiological consequences, too. In the most serious cases, untreated depression can lead to self-injury and even suicide, so it remains important to recognize the signs early on and seek help. When is it normal to experience depression? Individuals have reported depression after life-altering events. These events may include going through a divorce, the death of a loved one, or becoming unemployed. In these situations, it’s common for individuals to report depressed feelings. The line between healthy grieving and depression gets crossed, however, when clear changes in mood, affect and cognition persist for long periods of time and interefere with daily functioning. There seems to be a social stigma against depression. Why? This is not an easy question to answer. In 2007, Behavioral Risk Factor Surveillance System (BRFSS) noted that, “Only 25% of adults with mental health symptoms believed that people are caring and sympathetic to persons with mental illness.” Clearly, this fact reflects the larger phenomenon that persons suffering from a mental illness are not viewed the same as persons suffering from other disorders or diseases such as cancer, for example. Mental Illness seems to be interpreted differently. Over the years, however, the social stigma associated with depression is slowly beginning to evaporate, but problems remain. Some mistakenly believe that those suffering from depression can “snap out of it.” This is not the case. Because one’s risk factors compound after each subsequent depressive episode, the likelihood of having repeated episodes remains high. Contrary to the popular idiom that “depression is just a choice,” the psychological literature suggests that, depressive disorders are just serious medical conditions—and this means that those who suffer from depression ought to be treated no differently than those who suffer from physical ailments. What are some ways in which depression is treated? Mental Health Professionals have several tools for diagnosing a patient with depression, which range from self-reports to other methods. In serious cases, depressed patients may be admitted in to an in-patient treatment facility for care. Other interventions include therapy and medication. With regard to the former, therapies such as Cognitive Behavioral Therapy (CBT), Interpersonal Therapy and Solution Focused Therapy have been shown to be highly effective treatments for depression. 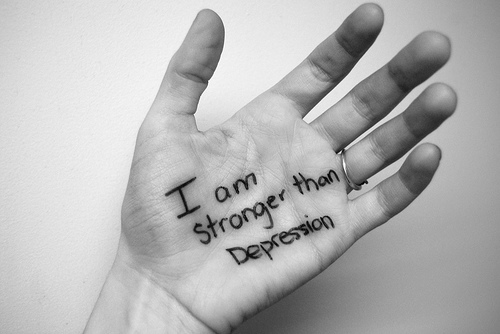 Mental Illness such as depression remains a serious condition that is a burden for many people. In addition, although it remains outside the scope of this article, a stigma about depression persists in many parts of the world; many individuals who suffer from a depressed mood also have the added burden of the social stigma that persists around the problem. Perhaps, through education and raising awareness, this sigma will abate. Nevertheless, knowing the signs and symptoms of depression as well as knowing when the line has been crossed between just feeling sad and feeling depressed remains critical. Depression may be described as the “common cold” of mental health disorders (meaning it effects large numbers of people), but that doesn’t mean hope is lost. Although much work needs to be done, the social stigma of depression and treatment options abound.